Christina’s introduction to yoga was at the age of fifteen when her mom invited her to a yoga class offered by a traveling yogi. Christina is originally from Puerto Rico and moved to Champaign in 2012 to pursue a master’s degree in Animal Science. During her time in grad school, she regularly attended yoga classes at the university’s recreation center. Christina was a karma yogi at Living Yoga Center (LYC) where she helped distribute flyers. Christina completed her yoga certification in May 2018. Christina has trained in 20-hour mindfulness meditation training program. 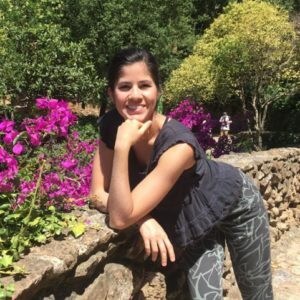 In her classes, she will encourage her students to become aware of their body and connect with the breath as she gently guides them through the asanas using detailed alignment cues. Students who attend Christina’s class can expect meditation, chanting, pranayama, and asanas with variations. As a teacher, Christina aspires to deepen her knowledge and expand her teaching skills. She also hopes to one day teach yoga to Spanish speaking communities.